Electron Microscopy Sciences is proud to introduce their own motorless, advanced-coil technology, stirrer to improve all of your stirring needs. It produces the strongest magnetic coupling for vicious solutions, with no moving parts, making this unit 100% wear-free and maintenance free. The magnetic coil technology works on the inductive principle with alternative current (AC) as its driving force. The generated moving magnetic field drives the spinning of the stir bar in the vessel. With advanced coil technology the strength of the coupling between the unit and stir bar is controlled by the amount of electric current that flows through the coil. The more turns of the wire making up the coil, a stronger magnetic field is produced.High-quality rare-earth magnets are used in the stirrer design to ensure a strong magnetic coupling with consistent accurate alignment which significantly reduces the chance of spin-outs. 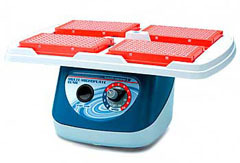 The magnetic induction stirrer is ideal for use in general research, life science, industrial, quality analysis, and clinical laboratory settings. Once a program has started, the speed, cycle and time can be monitored. The stirring speed can be adjusted while a program is running. 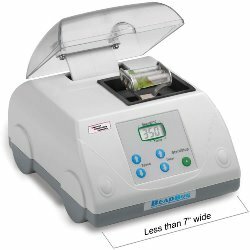 The BeadBug™ sets the performance standard for personal sized cell disruption and lysis instruments. 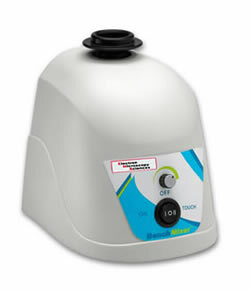 Developed for samples too tough to be homogenized in a common lab vortexer, the BeadBug provides a convenient and economical alternative to the traditional, over-priced homogenizers on the market today. 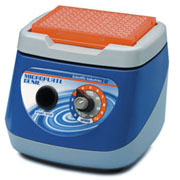 With a foot print of just 7 x 8" and a capacity of up to three tubes, the BeadBug is the ideal homogenizing instrument for low to medium throughput laboratories. 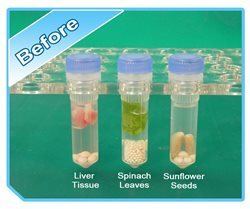 Simultaneous homogenization takes place (often within 45 seconds) of up to 3 samples inside the disposable 2 ml screw cap microtubes. 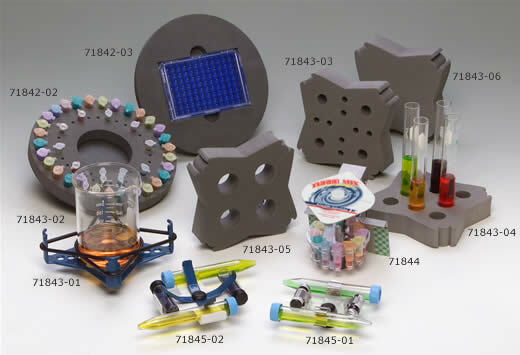 The optimized mixing motion causes rapid cell disruption through constant high velocity impact from the hardened micro-beads chosen specifically for your sample type. Timer 3 sec. to 3 min. Powerful is the best word to describe this mini vortexer. With a 4 mm orbit and fixed speed of 2800 rpm, the Vornado™ instantly vortexes even the largest samples, including nearly full 50 ml tubes. Despite its powerful motor, the Vornado™ has a footprint of less than 4 x 4", allowing it to fit on even the most crowded bench. Insta-Touch™ operation means that the motor is automatically activated with slight pressure on the center cup head. Operation is smooth, quiet and efficient. When pressure is removed, operation immediately ceases. The Vornado™'s unique head design prevents liquids from entering the housing, prolonging motor life. 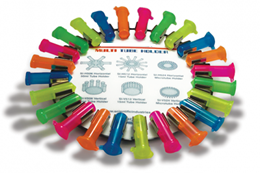 The unit is available with five different cup head colors. 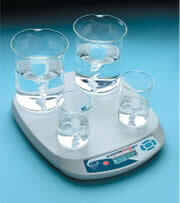 Dimensions 3.7 (W) x 3.9 (D) x 2.6 (H)"
The EMS Mortexer™ is more than your standard vortex mixer. 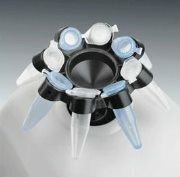 The unique design of the Multi-Head™ (included) features a traditional cup head for general purpose mixing, plus holds up to eight microcentrifuge tubes. The drive system is balanced with Q-Drive™ technology, providing a smooth vortexing action, while minimizing noise and excessive vibration. 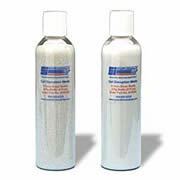 This results in quieter, more efficient and longer lasting operation. 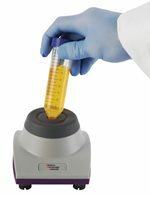 Increased speed, up to 3400 rpm, produces an instant vortex of even the largest sample sizes, including full 50 ml tubes. 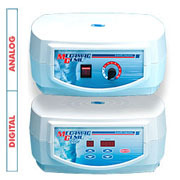 Other features include "no-walk" suction feet, cold room / incubator compatibility and spill-proof electronic controls. 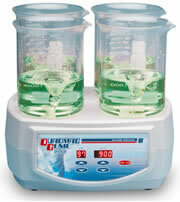 The EMS BenchMixer™ sets the new standard in vortex mixing. With advanced Q-Drive™ technology, the EMS BenchMixer™ provides unique counter-balance system creates maximum vortexing action, while minimizing noise and excessive vibration. This results in quieter, more efficient and longer lasting operation. This new Mini Vortexer offers immediate vortex shaking for a variety of tube sizes. It has a simple, touch start operation which enables exceptional mixing performance using one hand. 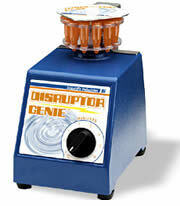 Versatile Vortex-Genie 2 mixes or shakes fluids in any type container with speed and precision. 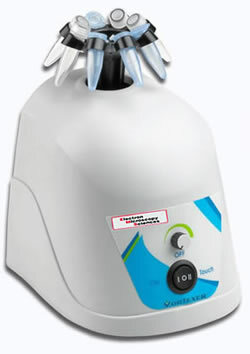 Vortex-Genie has long been the standard for laboratory mixing. However, now with the development of numerous new mixing heads, the range of applications for the Vortex-Genie 2 has been greatly broadened so its use is limited only by your imagination. 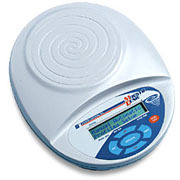 The Vortex Genie 2 is The Lab Standard that we have all come to know, and the Vortex Genie 2T is new with an Integral Timer. Shaking or Vortexing Action. 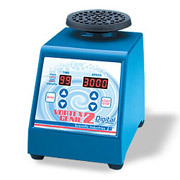 Variable speed control allows slow speed shaking action up to high-speed vortexing. In addition, each attachment is designed to produce different mixing actions, allowing users to choose the correct action for each application. Digital speed control and display. 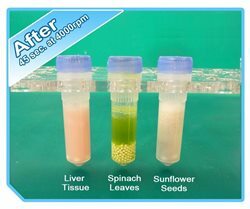 Provides accuracy, reproducibility and repeatability. Timer Function. Touch on for 1-99 seconds. Hands-Free for 1-99 minutes or continuous. Snap on these attachments for new ways to use your Vortex-Genie! Note that items marked with an asterisk (*) are included with Vortex-Genie 2 and Vortex-Genie 2T. High Speed Action For Increased Mixing Efficiency In Every Well! 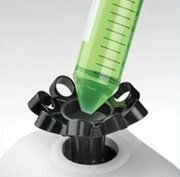 Snap on these attachments for new ways to use your Microplate Genie! Vortex Anything and Everything that only a Vortex-Genie can - Only More! Durable and heavy zinc die casting with specially designed feet prevents "walking"
Supplied with Two 12-Pack Multi-Tube Racks holding up to 24 tubes of any material up to 29mm dia., or up to six 250 ml vessels. The powerful single-position MegaMag Genie and Digital MegaMag Genie provide the optimal stirring for large volume containers. Both analog and digital feedback (true speed) versions are available. 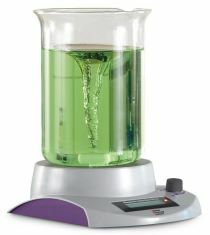 The powerful multi-position QuadMag Genie provides vigorous stirring for up to 4 vessels simultaneously. 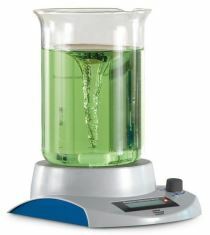 The revolutionary single-position MagStir Genie provides low to high speed stirring and editable memory profiles. Microprocessor controls offer precision and reproducibility without internal heat build-up.